Colorado is not a “community property” state, but it does have a category called “marital property.” In Colorado, most assets acquired during a marriage are considered marital property, which is subject to division by the courts in a divorce. The court’s ability to divide marital property if a couple divorces does not impact a spouse’s ability to give away his share of marital property to someone other than his spouse in his will. However, limitations exist as to how much a deceased spouse can leave to persons other than his surviving spouse. If a deceased spouse attempts to disinherit his spouse in his will or leaves very little to his surviving spouse, Colorado law gives the surviving spouse a right to take up to half of the decedent’s “augmented” estate, known as the surviving spouse's “elective share,” instead of taking the share given to her in the will. The augmented estate includes the total value of the decedent's probate estate and certain nonprobate transfers to others, but does not include expenses such as funeral and administrative costs. The surviving spouse’s elective share varies, depending on the length of the marriage, from 5 percent for a one-year marriage to 50 percent for a marriage that lasted 10 years or more. 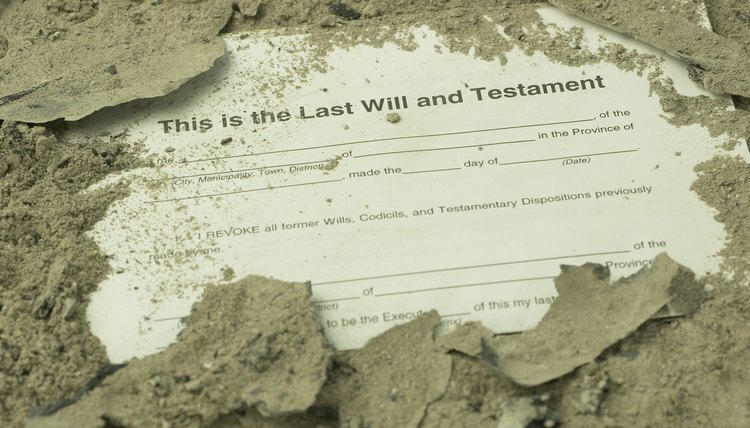 When a person dies without a will, he is said to have died “intestate,” and Colorado’s intestate succession laws determine who inherits his property when this happens. These laws attempt to pass property to close relatives Colorado law assumes the decedent would have wanted to inherit his property had he written a will; however, the law does not attempt to determine what each individual decedent would have wanted. Instead, Colorado law provides general categories that apply to every estate of a deceased person who did not leave a will. Under intestate succession laws, the surviving spouse’s share depends on whether the deceased spouse and surviving spouse have children together, separately or not at all. For example, if the decedent has a surviving spouse but no children and no surviving parents, the surviving spouse inherits the entire estate. If the decedent has adult children from another relationship, the surviving spouse inherits the first $100,000 of the estate plus half of the remaining estate and the children inherit the other half.